The foods you choose for your African grey have a direct impact on his health. A poor diet can make him feel lousy and even shorten his life. Frequent snacks should be considered part of his regular diet, since he's either gaining nutrition from good ones or paying the price with his health for poor ones. This means the best snacks to offer him are healthy ones that he also enjoys. 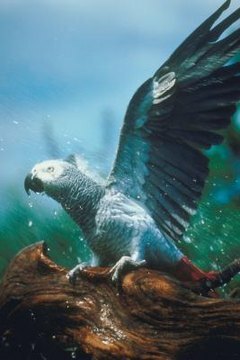 Fruit is a healthy snack for your African grey -- in small amounts. Fruit should make up only about 5 percent of his total daily diet. Wash fruit and dice it into small, bite-size pieces, taking extra care to remove any seeds, which could be deadly to your bird. Experiment with different fruits to see what your parrot prefers, such as banana, apple, strawberry, plum, blueberries, pear, peach, watermelon, cantaloupe or mango. Vegetables should be part of your African grey's regular diet -- up to 30 percent of his daily intake -- but if there are one or two types that he especially loves, reserve them as a special snack, or use snack time to introduce new ones. African greys are known to enjoy carrots, corn, sweet potatoes, peas, squash, green beans, sprouts and kale. Do not give your bird avocado or onion, which could kill him. Grains and legumes are a healthy snack for your African grey and add variety to his regular diet. They can be served warm, which some birds really love. Test the food first, however, and make sure it isn't so hot it will burn his delicate tongue. Most birds enjoy cooked brown rice, quinoa, barley and beans. Cook the grain or beans ahead of time and then freeze them in small baggies or containers to heat and serve at snack time. In small amounts, cooked pasta is a healthy snack with a different texture than your African grey's usual foods. Choose whole grain or vegetable-based pasta to give him a little extra nutrition, and offer pasta in different shapes and sizes to see what he likes best. Some snacks should not be a part of your bird's daily diet, but can be given on occasion as a special treat. These include anything that contains high amounts of fat, sugar or salt, such as nuts, seeds, potato chips, popcorn, cookies, candy or ice cream. It may be helpful to think in terms of the type of snacks you might offer a 3-year old child -- most of them should be healthy, but an occasional treat won't ruin his entire diet. Foods that can be toxic to African greys, as well as most other parrots, include avocado, chocolate, uncooked meat or eggs, moldy food, seeds from fruit and alcohol. Although the list is short, it should always be kept in mind when selecting a snack for your bird so he doesn't get ill or die from eating the wrong food.